« Academy Dance Center presents The Polar Express! See the Montgomery Zoo transformed into a Winter Wonderland sparkling with thousands of lights and festive decorations. Take a leisurely stroll, a brisk train ride or see the lights from atop the Zoofari Skylift Ride. Visit Santa, enjoy the live nightly entertainment and no winter’s night would be complete without some warming hot chocolate and fresh baked cookies. 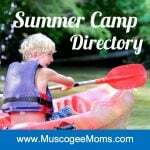 Make sure you check out the list of extra activities below. — Regular night time admission: $17 (ages 3 years old and older). Admission fee includes entry and one Christmas Lights Festival train ride. 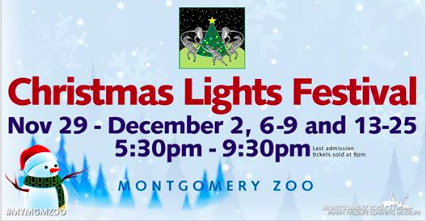 — Early Bird Admission: visit the Zoo and Mann Museum in the afternoon then stick around for the Christmas Lights Festival that night: $30 (ages 3 years old and older). Ticket includes entry to the Zoo during the afternoon, Christmas Lights Festival (same night) and one Christmas Lights Festival train ride.